I was that girl. I had struggled with my weight since I was in high school. I was never the “skinny girl”, the “fit girl”, or the “healthy girl.” My journey began the day I decided that it could happen for me. It is a mental determination that you have to find within. Once you make that decision, you will be unstoppable in discovering the success and greatness that lies inside. Now that I have lost 62 lbs, I look back and ask, “How did I do it? 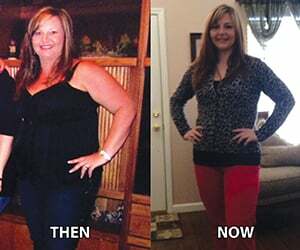 !” Joining Cal Fit and being introduced to an amazing motivator is how. California Family Fitness became a place I felt safe to go. I placed myself in a positive atmosphere and surrounded myself with others that had a passion for health and fitness. Gina Cargile, my personal trainer, has helped to motivate and inspire me to be my personal best. Through challenging workouts, dedication, and perseverance the pounds began melting away. I was no longer the girl that wished to be healthy, I was that girl! I have found an inner happiness and feeling of self-accomplishment because I proved to myself that I could do it. California Family Fitness and Gina Cargile have made my dreams a reality… but I am not done. Continuing to be better for my family, my friends, and myself is what I will continue to do. Health and fitness is not just a destination, it’s a way of life. Remember, it can happen for you. It just starts with the will to TRY. I am sure glad I did!